I am very crazy when it comes to food. other than bugs, monkeys and dogs (or any kind of pet or endangered animals like whale or tigers pfft) , I pretty much eat everything. 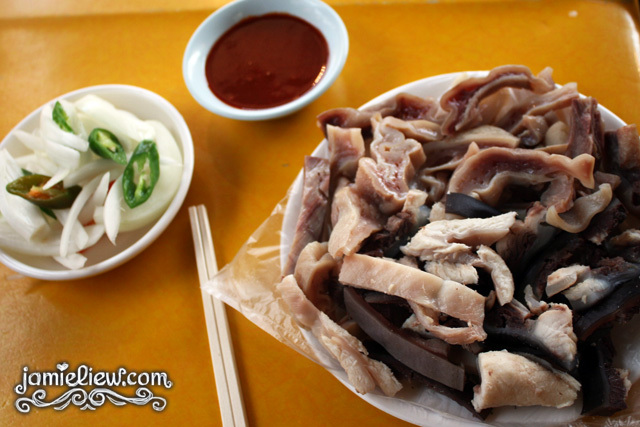 since I ate Sannakji (raw octopus) and definitely don’t mind eating something as disgusting as fermented raw fishes =D. 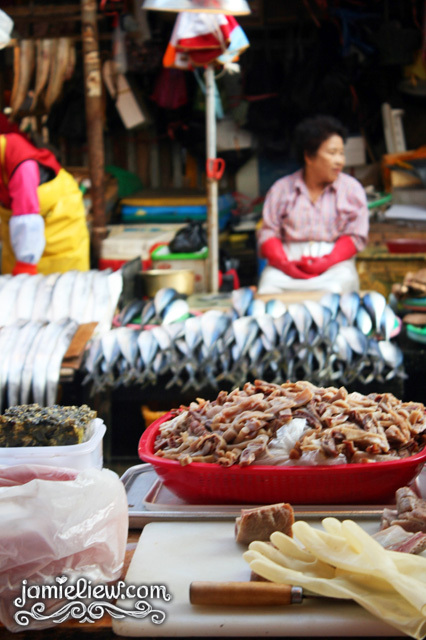 I’d blog about Jagalchi Market in a separate blog post, but just so you know, Jagalchi Market is at Nampo-dong as well, right opposite PIFF. and so my adventure on searching for disgusting weird food started. and we thought it wasn’t that weird until we asked what it was. because from the looks of it, it just look like some pig’s stomach thingy. which later when we ate it, it did not taste anything like it. there are only approximately 4 stalls selling these. it ain’t exactly raw but it tastes pretty raw. you dip it into their sweet chilli sauce (which I absolutely love) and usually the Korean uncles have it with Soju. this is so disgusting that the oldest Korean man I know here told me he won’t eat it. HAHAHAH. my view. this is how it looks like. it’s cut carefully and put on top of ice. look’s pretty damn weird. haha. a closer look. and I gotta reveal what it is yes? it’s called 상어내장 sang-eo nae-jang. we were completely clueless on what it is so we just ate it. but now on I won’t eat it U__________U. ANYMORE!! I felt bad after I checked it out on the internet. to know it’s Shark’s intestines. I initially thought it was just some fishes intestines. roarrrrrr how can they sell these! T_T. oh great nevermind. this adds to weird things that I’ve ate in my lifetime but will never eat it twice =S. I guess it’s the same like eating shark fins *sigh*. I don’t eat shark fin soup again. Unfortunately, shark fin still get demand. Hope that Chinese wedding dinner won’t serve fin soup again but this isn’t so easy to happen. 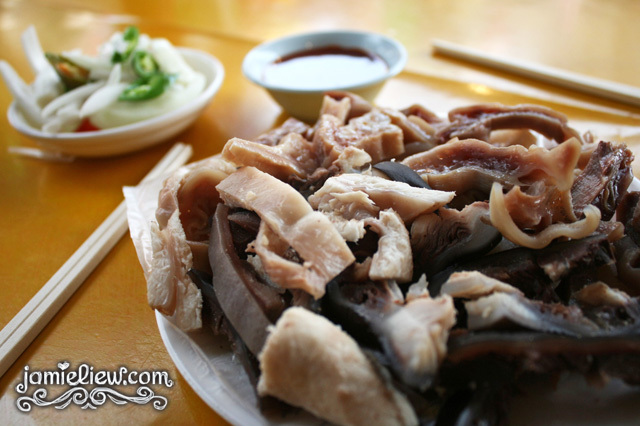 Do you miss taste of shark intestines? People don’t eat shark fins mostly because of animal torturing where fins are cut off and the still living shark are tossed back in the sea and let to suffer and dies. I personally don’t eat shark fin because of this reason. Eating shark meat was a okay in the beginning since they take the whole fish for food instead of just cutting out the fins and letting it suffers and dies But nowadays certain species are endangered and facing extinction due to fining that eating shark is hv become a threat. Then again, we’re shortage of fishes too. The fish population is depleting due to human’s over fishing. They have calculated that there are around 30yrs left. Humans. Their greed are destroying themselves and the world.